Maximum Motorsports Heavy-Duty series Rear Lower Control Arms for the 1979-1998 Mustang improve traction and handling by reducing the unwanted deflection allowed by the stock soft rubber bushings and flexible stamped steel control arm. Unique MM 3-piece bushing and spherical bearing design easily allows the articulation required for proper handling, and reduces the deflection that can cause wheel hop. Has over 400 rwhp: We recommend the MM Extreme-Duty control arms. Has under 400 rwhp, but is launched hard from a standing start, meaning a drag race style start from a dead stop, whether on the street or at the strip: We recommend the MM Extreme-Duty control arms. Why not use the Heavy-Duty control arms in those situations? For one reason: Those situations may overload the urethane, leading to premature failure of the bushing. When you hit your Mustang's throttle pedal, all of the forces accelerating your car pass from the rear axle housing through the lower control arms and their bushings; that's what moves your Mustang forward. The harder the car accelerates on launch, the greater the forces on the lower control arm bushings. Higher forces lead to a shorter lifespan of the bushings. 3-piece urethane bushings allow articulation while reducing deflection and damping noise transmission at the chassis end. Spherical bearing allows articulation while eliminating deflection at the axle end. MM Rear Lower Control Arms were designed by our engineering team to minimize fore/aft movement of the axle, while also retaining the suspension's ability to properly articulate. This improves performance without unnecessarily compromising ride quality or handling. Manufactured by MM in the U.S.A.
Deletion of spring perch and swaybar mount is available by clicking on the option button above. Unique design with 3-piece urethane bushings and spherical bearings allows proper suspension articulation. 3-piece urethane bushings at chassis end cause little change in NVH, maintaining excellent street manners. Strong and stiff 2" diameter round steel tube construction. 3-piece urethane bushing at chassis end. Large spherical bearing at the axle end. 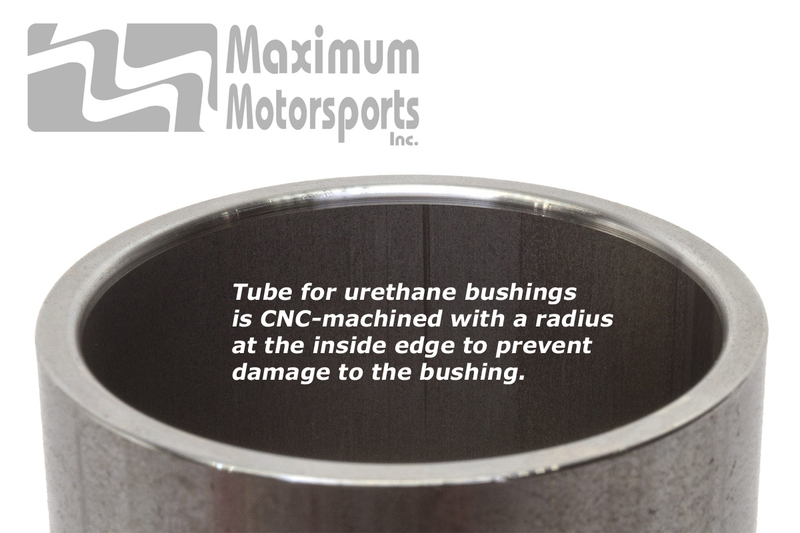 CNC-machined receiver tube for the urethane bushings ensures proper fitment, unlike more commonly used saw-cut tubes. Made by MM in the U.S.A. Beware of poor quality copies made overseas. Q: Can I use the MMRLCA-1 in a drag racing application? A: Yes, but; the heavier the car, and/or the harder it accelerates, the more quickly the urethane bushings will wear out. How quickly the bushings wear depends on the overall weight of the car and the magnitude of the acceleration off of the line (60' time). For cars over 3,200 lb and/or 60' times under 1.7 seconds, we strongly recommend our Extreme-Duty Rear Lower Control Arms. You can read Maximum Motorsports' detailed MMRLCA-1 Rear Lower Control Arm installation instructions before purchase.